(NewsUSA) - The Greater Fort Lauderdale, Florida area has become a hotbed of new dining options that embrace traditional favorites and current food trends, from farm-to-table spots to breweries and gastropubs. Many Fort Lauderdale eateries will be showcased in the Taste Fort Lauderdale event in conjunction with the South Beach Wine & Food Festival from February 22-26, 2017. Other events featuring Fort Lauderdale's food scene include the Las Olas Wine and Food Festival in Spring 2017 and an annual, popular dining promotion in August and September 2017. In addition, food trucks from Greater Fort Lauderdale eateries make regular appearances at sports events, concerts, and other entertainment venues. 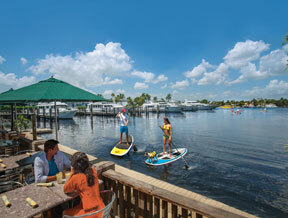 Waterfront: Many Fort Lauderdale eateries offer waterfront views or even dockside dining for boaters on the area's waterways, including the Blue Moon Fish Company. Italian: Louie Bossi's Ristorante Bar & Pizzeria presents homemade pastas, wood burning Neapolitan pizzas, home- cooked Sicilian comfort food and Chef Louie's house-cured salami. And it boasts an outdoor piazza with a fire pit and bocce ball court. Brunch: O-B House, in Fort Lauderdale's historic district, Himmarshee Village, offers breakfast favorites using fresh, local ingredients and is famous for its deep-dish corn pancakes. Bespoke cocktails: Apothecary 330 has 250 bottles of rare and specialty liquors and innovative libations served up by the speakeasy's "bar chefs." Craft beer: The Funky Buddha Brewery in Oakland Park is the destination's first industrial microbrewery. Seafood: Lighthouse Point's Cap's Place, Broward County's oldest restaurant and a national landmark that opened as a speakeasy in 1928, offers fresh seafood prepared in a variety of ways, including broiled, char-grilled, baked, pan-fried, pan-roasted, deep-fried, Johnny style, classic scampi style or blackened Cajun style. Health-conscious: Green Bar & Kitchen, a plant-based superfood cafe with two locations in Fort Lauderdale, serves a gluten-free menu that includes dairy-free, nut-free ice cream. Asian: Kuro, located at the Seminole Hard Rock Hotel & Casino, presents Japanese cuisine featuring contemporary artisanal dishes using both locally-sourced and imported ingredients directly from Japan. Coffee: Don't forget the coffee. Fort Lauderdale favorites include Grind Coffee Project, where patrons can enhance their brew with toppings including Nutella, balsamic vinegar and candied bacon. For more information about the Fort Lauderdale dining scene and the area in general, please visit sunny.org/restaurants.